Hastings House, c1979, no other printings listed, probable 1st Edition,128 pages. VERY GOOD+ Condition Hardcover with a VERY GOOD+ Dust Jacket protected in a Mylar Cover. This book is exlibrary with usual markings, library binding, fep removed, very light wear & dj corner clipped. Pages & Binding are NICE & TIGHT! 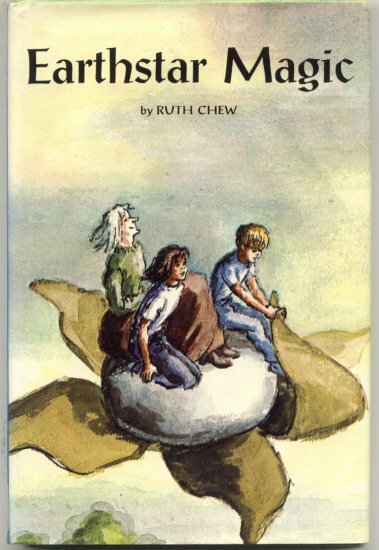 Ellen and Ben meet a friendly witch who reveals the magic power of the earthstar to them. Now that he was on the earthstar, Ben was so excited he forgot everything else. "Show me how you make it fly, Trudy." Trudy took hold of the tip of one point. She pulled it toward her. At once the earthstar flew up into the air. When Trudy moved the point to the right, the earthstar turned right. She pushed it the other way. The star turned left. They were flying!